Another tilapia recipe from Shape magazine. Preheat the broiler. Cut the tilapia fillets lengthwise into two pieces, then pat dry with a paper towel and season to taste with pepper. In a small bowl, combine basil and Parmesan cheese; set aside. 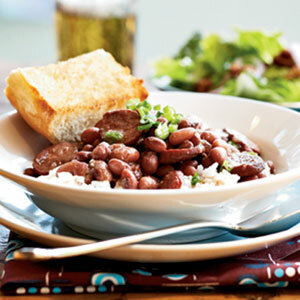 In a large saucepan, bring water for beans to a boil. Heat olive oil in a 12-inch heavy ovenproof skillet over moderately high heat until hot but not smoking. Sauté the fish for 3 minutes or until brown. Flip the fillets over and remove the skillet from heat. Dust the tilapia with the cheese mixture. Place the skillet under the broiler to finish cooking the fish and slightly brown the cheese, about 3 to 4 minutes. As the fish cooks, add beans to boiling water. Lower heat and cook for 5 minutes or until bright green (beans should still be crisp). Drain beans and run under cold water. Shake off excess water and set aside. Mix lemon juice, lemon zest, pepper, and olive oil in a medium bowl. Add green beans and toss to coat; warm for 30 seconds in the microwave. Divide fish fillets and green beans on two plates and serve. Heat olive oil in a skillet over medium heat. Add shallot and vinegar and cook for 2 minutes. 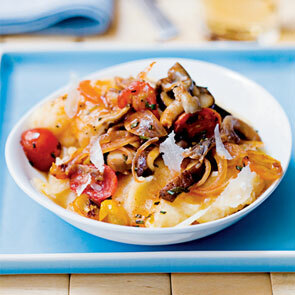 Add tomato paste and mushrooms; cook for 5 minutes, stirring occasionally. Pour in ½ cup broth, bring to a boil, and reduce to a simmer. Cook for 5 minutes. Add grape tomatoes and cook 5 more minutes until sauce thickens slightly. Remove from heat. Bring 3 cups of broth, rosemary, and sage to a boil in a medium saucepan. Slowly pour in polenta. Cook over medium heat, stirring constantly for 4 to 5 minutes until mixture thickens. 1. Preheat grill or grill pan and prepare couscous according to package instructions. 2. Combine chili powder and 1 tablespoon olive oil; brush over tilapia. Grill fish for about 2 minutes on each side. 3. Meanwhile, in a large bowl, combine 2 1/2 tablespoons olive oil, lemon juice, sugar, soy sauce, scallions, parsley, and avocado. Fold into couscous and season to taste with salt and freshly ground black pepper. 4. 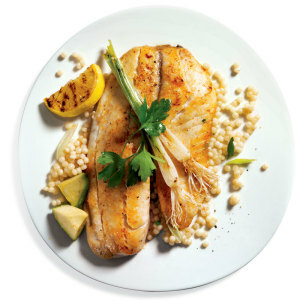 Place each fillet on a bed of couscous; garnish plate with grilled lemon (optional). Continue simmering until the mixture starts to thicken, about 20 minutes. Remove from heat and transfer to a blender; blend until smooth. Return mixture to pot and heat for 10 minutes on low until it reaches desired thickness. Remove, cool, and serve. Apple-Cinnamon: Add 1/2 pound of peeled and diced Granny Smith apples, 3/4 cup apple juice, 1 1/2 teaspoons ground cinnamon, and 1/2 teaspoon ground ginger. Spread this on toast for a sweet treat. Cardamom-Clove: Add 1 teaspoon ground cardamom, 1/2 teaspoon ground clove, and 1/2 teaspoon ground allspice. This slightly more savory butter goes well with meats such as pork. The fast food of Japan, donburi (which means “bowl”) consists of rice topped with seasonal veggies and lean meat. This version features good-for-you spinach, which delivers 13 types of flavonoids that fight cancer, vitamin K to build bones, and folate and magnesium to protect against cardiovascular disease. 1. Place a wok or large nonstick skillet over medium-high heat. 2. Add 1 teaspoon oil plus spinach and cook until spinach wilts and turns dark green, about a minute. 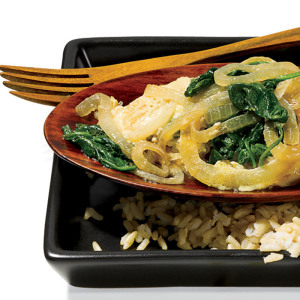 Remove spinach to plate. 3. Add 1 1/2 teaspoons oil to wok. Stir in onion and cook for 2 minutes. Stir in 8 teaspoon salt. Add ginger and cook for 45 seconds. 4. Sprinkle chicken with remaining 8 teaspoon salt and add to wok with remaining 1 1/2 teaspoons oil. Cook until chicken is opaque, 2 to 3 minutes. Reduce heat to low. 5. In a small bowl, whisk together broth, soy sauce, and mirin; add to wok. Stir in spinach and cook until mixture begins to bubble gently. Pour eggs over top of chicken-spinach mixture; cover and cook until eggs set, 2 to 3 minutes. 6. To serve, spoon a half cup of rice into each of four deep soup bowls. Top with chicken-egg mixture. In a pot, bring stock and rice to a boil. Cover, reduce heat to low, and simmer until liquid is absorbed, about 40 minutes. Saut?eppers, onions, and garlic in oil until softened. Add sausage and saut?ntil brown. Add beans and one cup of bean liquid, diced tomatoes with juice, thyme, and bay leaf. Simmer uncovered for 20 minutes, stirring occasionally. Season with pepper and hot sauce. Add rice to bean mixture. Stir to combine. Remove bay leaf.